Summer has come to an end and Thanksgiving is just around the corner. You probably are thinking you’ve lost the opportunity to sell, and need to wait till next Spring or Summer. But that’s far from the truth! Although it’s not as hectic and crazy with the swarm of buyers on the market, the fall season brings out the most serious of lookers. They are the pool of buyers that waited out the summer frenzy to find their perfect home in the fall, and you don’t want to miss these buyers! They are ready to make a move, today! And selling in a slower period does not equate to less money. That’s a misconception that home owners have based on untrue data that floats around. With the right agent, and your home being priced correctly, you can get a great deal selling your home during the fall season. And might actually prefer it. Here are the top 3 benefits to listing during the fall season. 1. Serious Buyers – Let’s be honest, if buyers are out during the fast and furious Spring-Summer market looking for homes, they aren’t always serious and ready to buy. Although the summer brings in a large crowd, that crowd contains a lot of people that are excited by the season, and fall into the “trend” of house hunting. These people end up not really being serious about the process, and tend to hold off for another time. If people are investing time to look during the fall season, they are more likely to be interested in actually buying your home, instead of touring it. 2. Less Competition – Selling in the fall isn’t something many families can accomplish due to personal schedules. That’s why a significant amount of homes get listed during the summer season. Which means that summer time brings in a lot of competition. Selling in the fall means the potential house next door that has slightly more perks that may have been listed during the summer, is no longer your competition because it has already sold. With a slower season, you get dedicated attention to your property, which increases the chance of a sale. 3. Easier to Find Your Dream Home – Not only do you get to benefit from a slower season during the selling process, but you can also benefit on the buying side. With less competition on your dream house, you can sometimes get a better deal. The summer brings a lot of missed opportunities for buyers on their dream homes, because they go off the market instantly. This will give you the opportunity to get your home on the market and take your time to find the right one to resize into. A much calmer pace to the transaction will make it less stressful, and everyone all around happier. Don’t feel rushed into buying a home overnight during the summer, it could turn into a headache. If you want a far more peaceful transaction, that has calmer pace, then selling during the fall is perfect for you. Fall is more than pumpkins and holiday celebrations, it is the perfect time to make that move! These days, prom has gotten a lot more expensive than it used to be and the money spent on tickets, dresses or tuxes, dinner, a trip to the salon, a limo, or an extravagant “promposal” can really add up. To help with that, Remington College’s Dallas Campus will be offering their Prom Night Makeover event for Dallas area students going to prom. The even is free of charge. Students in Remington College’s Cosmetology program will provide the prom-goers with free haircuts, up-dos, manicures, pedicures, and makeup. The makeovers will take place at The Salon at Remington located at 1640 Eastgate Dr. in Garland. Make sure to call 972-698-3890 to schedule an appointment and to get more details. I am sure appointments will book fast, so don’t delay. FEAT-NT (Families for Effective Autism Treatment-NT) is a non-profit organization for parents and concerned professionals. They are hosting their annual Easter “Eggstravaganza” especially for our friends on the spectrum. Often, a big outing full of people, loud noises, and all that comes along with that, can be a total sensory overload for a younger child with an ASD. 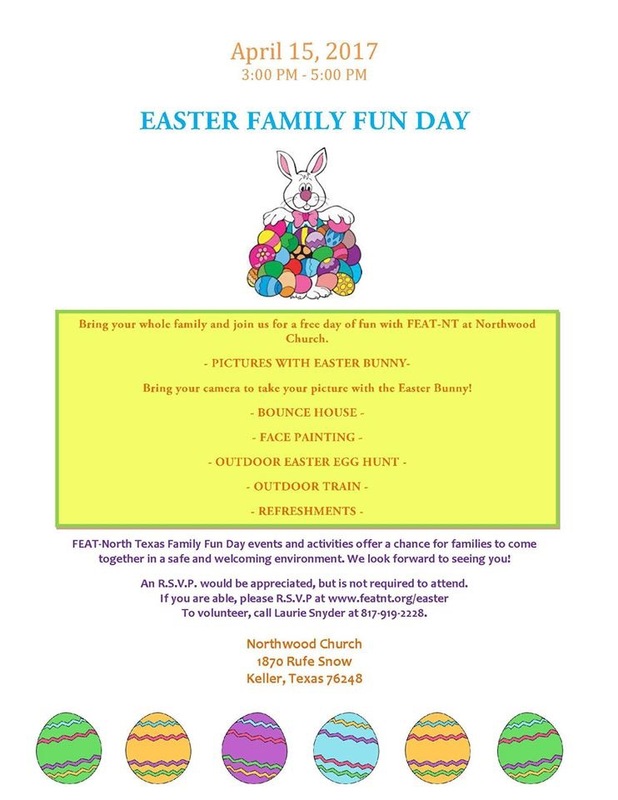 FEAT-NT and the Northwood Church of Keller offer an accepting environment geared towards making sure ALL children have the opportunity to enjoy the Easter fun. Pictures, games, a egg hunt, plus much more is there to enjoy free of charge with your children. Spread the word, and make sure you RSVP at http://www.featnt.org/easter so they will know you are coming and will have enough for everyone to enjoy. Looking for something fun to do this weekend? Try your luck as the North Texas Irish Festival. This magical event is being held from March 3rd to March 5th at Fair Park in Dallas. “Texas Grown – Irish Roots” is the theme this year and it celebrates the amazing music, dance, and cultural talent in and around Texas and incorporates the tradition of Irish and other Celtic influences. Top musicians and skilled dancers from around the world will be performing on 13 stages. Music, dancing, whiskey tastings, blacksmithing demonstrations, horse displays, Celtic storytelling, animal rescue groups, Shepherd’s pie, Irish stew, dozens of activities for kids and child-friendly entertainment, and chef demonstrations are among the any things to do and see at this festive event presented by the Southwest Celtic Music Association. Tickets will be available online and at DFW-area Tom Thumb stores in Feb. 2017. Friday night is free from 6-7pm but it is $10 after 7pm. Saturday, one day tickets are $20 at the gate, $15 on Sunday. Two-day tickets are $25, and a weekend pass is $30. Children 11 and under FREE when accompanied by adult family member. Seniors over 65 and current military members (with valid military ID) receive $5 discount. There is a $14 any day pass available at Tom Thumb grocery stores. Dogs are allowed in on a short leash, but a $1 donation is requested and will be given to various animal rescue groups supported by those involved with the festival. If you are dressed as a Leprechauns in full ceremonial dress and carrying a pot of gold, your ticket is FREE. Live on stage: Barrule, Breaking Trad, Brian McNeill, Brock McGuire Band, High Kings, The Elders, Máire Ní Chathasaigh, Chris Newman, The Town Pants, and We Banjo 3, and many more. Click here for tickets or more details. ​Laissez Les Bon Temps Roulez DFW! Let the good times roll, because Mardi Gras is coming to the DFW area. Not able to get to New Orleans for Mardi Gras this year? Well that doesn’t have to stop you from celebrating just like they do in Louisiana. Lake Dallas is hosting their 12th annual Mardi Gras celebration on Friday, February 24th, 2017 from 5-9pm. So, get dressed up in purple and gold and head over to this family-friendly event. Live music, parades, food and much more await you. Collect all the beads you want from the festive floats as they pass by during the parade. Don’t worry, bead collecting at this festival is a PG production. Vendors and Food Trucks are on hand to keep bellies full throughout the evening along with a variety of activities for all ages. Before the night is over, Mardi Gras goers are sure to be dancing in the street while listening to the sounds of the returning headliner, The N’awlins Gumbo Kings. Don’t forget to head on over to the crawfish eating contest, it’s guaranteed to be a good time whether you are eating or watching. This is sure to be a fun night for all ages. Today is National Margarita Day, a celebration of a sacred tequila lime drink that is held dear to many. In response to that, many restaurants will be honoring the tasty beverage with drink specials. On the Border has become the self proclaimed celebration headquarters by offering discounted margaritas today. The price and hours vary depending on location so definitely check the On the Border site to see what your location is offering. Their are various other restaurants partaking in the festivities throughout DFW and the entire Unites States. Check the National Margarita Day site for more details. There is a party today no matter where you live.